We’ve discussed self-taught art, nineteenth century academic art, and contemporary issue-oriented art in relation to African American History Month. Let’s now talk about black art that has been on the cutting edge of abstraction, at a time when there was a debate within the African American artists’ community: should African American artists continue to document black participation in American society or should they document how black artists had become part of the mainstream of contemporary American art? Interestingly, many African American artists involved in contemporary abstraction evolved their own personal dialogue with abstraction to become a valuable addition to American modern art, and, in a broader sense, to contemporary art on a global level. The Civil Rights movement in America during the 1960s engendered the first true revival of African American art since the Harlem Renaissance (ca. 1920‒1939). There were still artists who advocated that black artists should produce work that reflected the black experience. There were others, yet, who felt that the African American artist’s individual style, even if it was abstract, was as important to the artistic pool. Such a discourse led to the formation of the Spiral group in New York (1963‒1965). The main tenets of the group were that the artists were free to explore the various forms of abstraction present at a time with only minimal relation to the African American experience in America. The styles within the group ranged from Abstract Expressionism to Social Realism. The divergent views by black artists to express the African American point on view became one of the grounding stones of the Black artistic movement in the early years of postmodernism. William T. Williams, born in North Carolina, moved with his family to New York and studied art during the waning dominance of Abstract Expressionism. He studied at Yale under such milestone minimalists as Al Held (born 1928). The artists at Yale were part of the rejection of the emotive, personal signature style of Abstract Expressionism in favor of more formal types of abstraction such as Minimalism, Color Field, and Hard Edge. 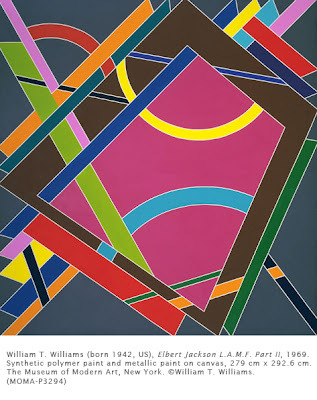 Held’s teaching helped Williams pursue a painting style that was a synthesis of the Minimalist emphasis on the grid, and the exploration of subverting it to establish the sense of figure and ground through vibrant color. At a time when most artists’ works were “Untitled,” Williams gave a personal aspect to his type of Minimalism by naming this painting for his grandfather. Rather than a static grid, he creates a sense of movement not only with the bright colors, but also the concentric, asymmetrical diamonds that touch all four corners. In many ways, his work prefigures by a couple of decades the work of such 21st century minimalists as Sarah Morris.